A recent well-known advertising emphasizes on a series of primacies Italy shares with other Countries. A special leadership, though, unconditionally belongs to Sicily. We are talking about a delight, a summer coolness that preserves our palate from the stifling heat of this land. Ladies and gentlemen, here's the queen of the summers; the one which holds out against all fashions; in a word . the granita. As belonging to the royal family - the regalness of the refined taste and of the greedy - every city claims its paternity, its first steps, the original print and the success. Ragusaonline offers its visitors an Iblean version of the granita, and, even better, what for Modica is a tradition, and that, along with other sweet specialties, has made this town famous. The granita came out of ancient experiments. One of these concerned with preserving some snow, then sprinkled with syrup, under a paillasse. An earliest rough equipment to produce granita is kept at the renowned "Caffè Orientale" of the Cavaliere Civello. A tub was turned around inside a small well, arising ice from between, which was "kept" by means of coarse salt (2 parts of salt and 1 of ice). After that the "monsù", a typical figure of the time, used to load the tub on his back and delivery the granita where mostly ate, that is to say, at the numerous aristocracies' parties. 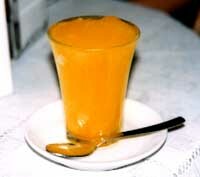 "Mezza" was the term, sometimes still used, to call the granita. Literally meaning "half", it indicated, according to Giuseppe Iacono - once apprentice at the "Orientale" and today owner of a "temple" of the granita, the well-known "Caffè dell'Arte"- the approximate amount of half a lemon, needed to flavour the ice of one granita "al limone". Once coined, the term was extended to all the different flavours of granita. Nowadays modern equipments, like the so-called "mendecatrice", work automatically, yet the wise and magic hand of the "pasticciere" is always fundamental. How many times do we happen to eat an over-frosted granita, because over-sugared or scarcely stirred once put in the counter? As to the flavour, a lot of choice is available. Lemon or coffee are classics at breakfast, unfailingly accompanied by the celebrated brioche, a bugbear for lovers of fitness and diet - in this case a lighter "panino" is an excellent surrogate. White or roasted almond or strawberry meet the most refined tastes; chocolate for the greedy and mulberry, rigorously black, for the gourmet - white, though sweetest, does not sufficiently keep its flavour. Coupling, too, have rigid rules: ok for chocolate, coffee, mulberry, strawberry with panna; never, lemon with panna. An original alternative has been created by Iacono fifteen years ago: it's called "anti-rust" and consists of granita "al limone" sprinkled with some Aperol".